This book is written as a starting point toward helping the large portion of our population that suffers from anxiety disorders to overcome their fears and control their anxiety. It is a resource to enable those suffering from anxiety to take control of their lives and become an active participant in their own recovery. This book is essentially divided into two parts: a discussion of anxiety and its physical and emotional effects on sufferers. 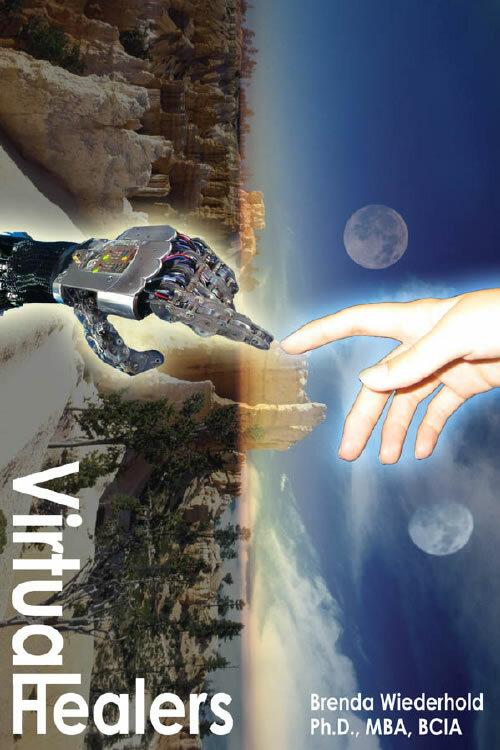 While Virtual Reality Therapy is described, its use is not necessary in order to follow the suggestions in this book. The lessons and worksheets included can help in a variety of areas, not just anxiety, but anger, mild depression, and feelings of helplessness. Expose Yourself! is a tool to help those who are attempting to overcome specific phobias with self-guided exposure therapy. Along with information about anxiety disorders and Cognitive-Behavioral techniques, this exposure companion contains hundreds of suggestions for possible exposure hierarchies and situations. 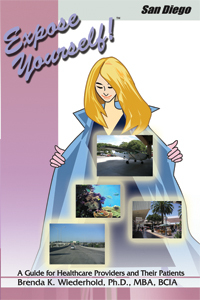 The book includes photographs and descriptions of a variety of exposure options around San Diego County, but this book can be used for exposure inspiration in any location. Future volumes will be available for different locations around the world. This book is an invaluable guide for those using it as an adjunct to therapy or for those attempting to overcome their fears on their own. Virtual Reality in the Mental Health arena is barely over a decade old. Because VR is still such a young and focused field, the members of its community have come together as a tight-knit family. In Virtual Healers, Dr. Brenda K. Wiederhold, herself a pioneer of VR, sits down in casual one-on-one interviews with more than a dozen of the top researchers of this select group. As a fellow scientist and friend, she allows the reader a rare, in-depth look inside their world. Along with her, you will discover the answers to how these remarkable men and women came to the VR field, what successes and set-backs they have experienced, what keeps them going, as well as how this technology has affected them both personally and professionally. 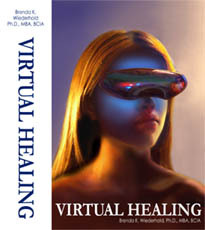 Virtual Healers is a must-read for the general reader as well as for any healthcare providers who have experienced VR treatment, are considering it, or have an interest in how advanced technologies are shaping the future of health care. Along with aliens and time travel, virtual reality (VR) is often thought of as a science fiction dream. Though it was developed nearly five decades ago, the use of VR in the private sector, particularly in the field of patient care, has become a possibility only in the past decade. As programmers are creating more detailed and interactive environments, the rapid advancement of technology combined with decreasing costs has turned VR into a promising alternative to traditional therapies. VR allows therapists to create a safe, low-cost environment in which they can easily modify the speed and intensity of the therapeutic process. With this ability to tailor the virtual experience to each specific patient’s need, the necessity to educate the patient has become increasingly significant. Virtual Healing fulfills that need. 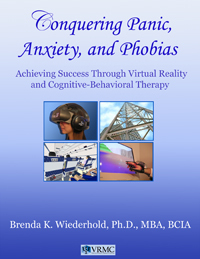 In twelve clear chapters, Dr. Brenda K. Wiederhold, one of the pioneers in the use of VR, plainly discusses the application of VR for Specific Phobias, Posttraumatic Stress Disorders, Panic Disorder, Eating Disorders and Obesity, Pain Distraction, Education and Training, Nicotine Addictions, Physical and Neurological Rehabilitation, Erectile Dysfunction, and Schizophrenia. She will explain the symptoms of each disorder and how VR can help. 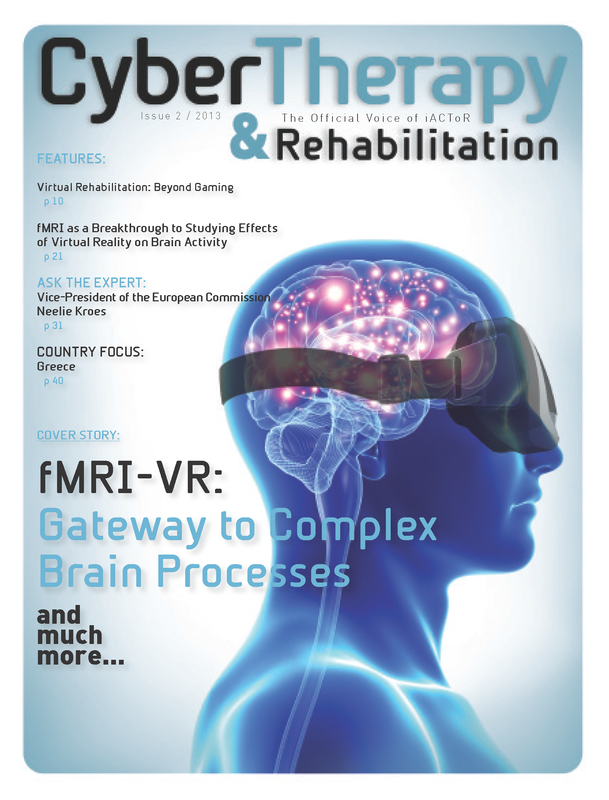 Further, the reader will meet researchers from around the world who are working to advance the use of VR treatment, and hear from patients who have undergone the process. It is Dr. Wiederhold’s hope that this book may serve as a source of information as well as comfort. There have been thousands of volumes published throughout history containing famous quotations. Many of these are well organized, comprehensive, and extremely helpful for researchers. However, often these books are unwieldy, and the task of finding quotes relevant to a specific purpose is frankly not feasible for the casual reader. 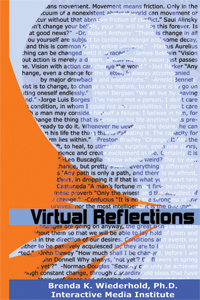 This is where Virtual Reflections is different from other quote compilations. I have selected the quotes and passages included here to be tailored specifically for those who are attempting to overcome panic, anxiety or phobias. In addition, many of you may find this book useful if you are experiencing feelings of mild depression, or simply need an outward source of inspiration in your life. My goal is not to have this book be a substitute for treatment, but instead to have it serve you as an aid as you progress along your journey towards recovery. My hope is that it may be a source of comfort and strength, bolstering your spirit and helping to ease those difficult moments you may encounter as you begin working towards overcoming your anxiety.